In an attempt to take the lead in providing the best video game experience to its players, Microsoft is working on enlarging its library of exclusive video game titles. Insomniac Games, a video game development studio that was once fiercely loyal to Sony, is now developing the next big Xbox One-exclusive open world third-person shooter title known as Sunset Overdrive. 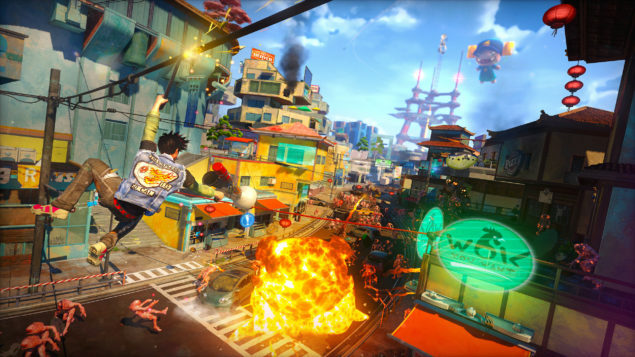 According to the developer, Sunset Overdrive runs at native 900p resolution and 30 frames per second, and is the biggest game ever developed by the studio. Insomniac Games, an America-based video game developer that is cherished for its PlayStation-exclusive Ratchet & Clank and Resistance video game series, is doubling down on what it is best known for with the upcoming open world third-person shooter video game known as Sunset Overdrive. This video game is exclusive to Microsoft’s latest Xbox One console. The developer, after learning from its previous missteps that took away from Fuse’s charm, is putting all its efforts into creating a perfect world for Xbox One players that is filled with unlimited fun, crankiness and color. Officially confirmed as the biggest video game ever created by Insomniac Games, Sunset Overdrive is an exciting game that embraces the visual capabilities of the latest console. Set in a rapidly moving world that is awash with the glow and hue of the next-gen game development technologies, the upcoming game is apparently a perfect mix of shooting and fighting and stunt-rousing mechanics that make its gameplay experience count among the most immersive ones. Price also stated that the Xbox One June SDK update, which came after Microsoft removed the Kinect sensor from the standard Xbox One bundle, provided a slight boost in the console’s CPU power for developers. Taking advantage of the CPU boost, Insomniac Games improved Sunset Overdrive’s physics, navigation and AI. Sunset Overdrive is set to launch on October 28 exclusively for Xbox One. If you haven’t bought Microsoft’s latest console yet, and you plan to do so, don’t miss out on the special-edition Xbox One bundle that includes the game and a white system at a special price of only $399.